Queenstown Bungy jumping is the best in the country. A mecca for all adventure sports and outdoor pursuits, there are plenty of places to bungy in Queenstown - as well there should be, because this is where it was 'invented' in New Zealand! Bungy Jumping in Queenstown is one of the most popular activities here. Queenstown has long been known as the adventure capital of New Zealand, so this is where all the best bungy jumping places are. The famous AJ Hackett set up the country's first bungy jumping site, over the Kawarau River, which is still there today. The original and best? 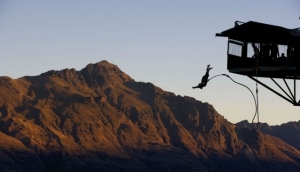 You'll have to try all three Queenstown Bungy Jumping sites to be sure. Head to The Ledge, above the Gondola, which has a runway jump so you can literally run off the edge of a cliff. The Ledge also does night jumps for the truly insane. The final site is Queenstown Nevis Highwire, with a 440ft drop straight down to the river. If you're after the ultimate adrenalin rush, or just need to get rid of that hangover, a Queenstown Bungy Jump is essential medicine.